“I would like to believe that with each coil or tap of the paddle, with each pinch or twist of the clay, the sculpture within reveals itself through gesture and line. It is after all the essence of the object that is most important to me. Truthfully, the animal representation is a means of giving an identity to my greatest interest as an artist, the organic form. The organic form is primal and simplistic and speaks volumes regarding the core of our being and our connectedness to one another. As a child it pained me to observe any concept of separateness, more importantly division. It has been my life’s exploration to identify those crevasses and attempt to understand and heal them through my work. But when the sculpture is complete, there is the animal, complete with experience and feelings with its own voice and message to lead me forward. 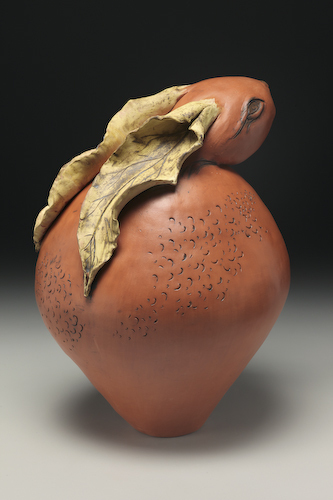 It was quite by accident that I chose the oldest and most rudimentary clay, earthenware. It was by complete happenstance that I enjoyed and pursued the oldest process of creating clay forms, coiling and pinching. And it was a surprise when I found what I loved for my surfaces, terra sigillatta, was the oldest form of sealing clay. It is great to know that my interests are ancient and very few things in my life contrived, but purely organic – much like our dear Mother Earth.